Hopefully you pulled off an equally successful prank in honor of the inaugural April dia. Oh my! I pretty much forgot what day it was, but that's a good one! Is it weird that I think this is hilarious? Please say no. My facebook was blowing up yesterday with pregnancy announcements- I'm still waiting to see which ones are real. Hahahaha...oh priceless. Then again, I've already promised my daughter to a nearby convent, so no worries there. Hilario! I got taken by a facebook status that read R.I.P. Angelina Jolie. I nearly fell out of my chair before frantically googling the news, and then promptly feeling like an idiot 30 seconds later once I realized. ha ha! 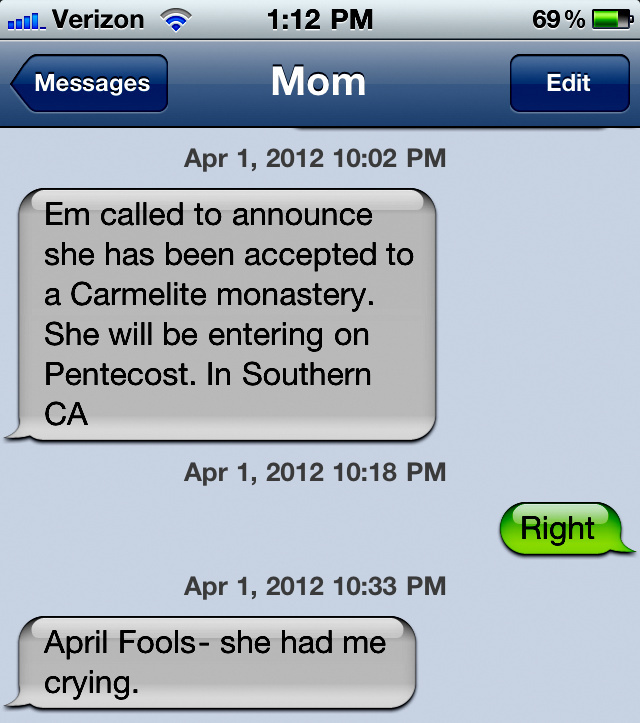 Catholic version of an April Fool's Day prank since, most likely, only a Catholic mom would actually believe it! lol. I lamely announced at breakfast 'my water just broke' and then continued eating pancakes. I convinced a friend that I was asked on the Dr. Oz Show to explain NFP as a natural alternative birth control on a Woman's Wellness Episode. She immediately started giving me advice, asking when the taping was, etc. It was funny.